(3) The implicit favorite model or the game man. You will notice that each model differs on the assumptions it makes about the person or persons making the decision. 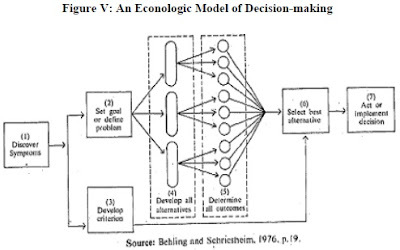 The econologic model represents the earliest attempt to model decision process. Briefly, this model rests on two assumptions: (1) It assumes people are economically rational; and (2) that people attempt to maximise outcomes in an orderly and sequential process. Economic rationality, a, basic concept in many models of decision making, exists when people attempt to maximise objectively measured advantage, such as money or units of goods produced. That is, it is assumed that people will select the decision or course of action that has the greatest advantage or payoff from among the many alternatives. It is also assumed that they go about this search in a planned, orderly, and logical fashion. 7 Act or implement the decision(best alternative). Fourth, people can rank the consequences in a consistent fashion for the purposes of identifying the preferred alternative. As you can possibly imagine, the human mind is simply incapable of executing such transactions at the level and magnitude required for complex decisions. To that extent, this model is unrealistic. However, due to the advent of sophisticated data storage, retrieval and processing machines, it is now possible to achieve economic rationality to some extent. An alternative model, one not bound by the above assumptions, has been presented by Simon. This is the bounded rationality model, also known as the administrative man model. 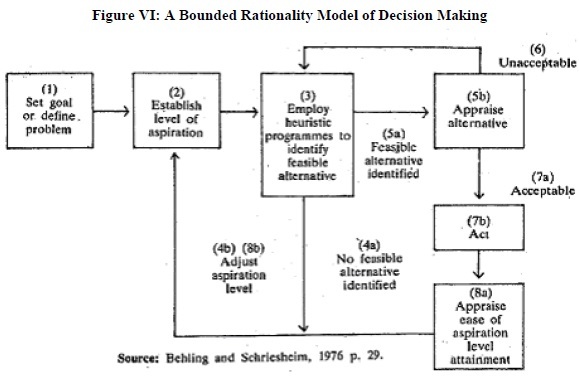 As the name implies, this model does not assume individual rationality in the decision process. Instead, it assumes that people, while they may seek the best solution, usually settle for much less because the decisions they confront typically demand greater information processing capabilities than they possess. They seek a kind of bounded (for limited) rationality in decisions. Sequential attention to alternative solutions: People examine possible solutions to a problem sequentially. Instead of identifying all possible solutions and selecting the best (as suggested in the econologic model), the various alternatives are identified and evaluated one at a time. If the first solution fails to work it is discarded and the next solution is considered. When an acceptable (that is, `Good enough and not necessarily the best) solution is found, the search is discontinued. Use of heuristics: A heuristic is a rule which guides the search for alternatives into areas that have a high probability for yielding satisfactory solutions. For instance, some companies continually select Management graduates from certain institutions because in the past such graduates have performed well for the company. 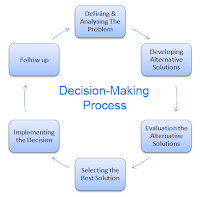 According to the bounded rationality model, decision makers use heuristics to reduce large problems to manageable proportions so that decisions can be made rapidly. They look for obvious solutions or previous solutions that worked in similar situations. Satisfying: Whereas the econologic model focuses on the decision maker as an optimizer, this model sees him or her as a satisfier. An alternative is optimal if: (1) there exists a set of criteria that permits all alternatives to be compared; and (2) the alternative in question is preferred, by these criteria, to all other alternatives. An alternative is satisfactory if: (I) there exists a set of criteria that describes minimally satisfactory alternatives; and (2) the alternative in question meets or exceeds all these criteria. 1 Set the goal to be pursued or define the problem to be solved. 3 Employ heuristics to narrow problem space to a single promising alternative. 4 If no feasible alternative is identified (a) lower the aspiration level, and (b) begin the search for a new alternative solution (repeat steps 2 and 3). 5 After identifying a feasible alternative (a), evaluate it to determine its acceptability (b). 6 If the identified alternative is unacceptable, initiate search for a new alternative solution (repeat steps 3-5). 7 If the identified alternative is acceptable (a) implement the solution (b). 8 Following implementation, evaluate the ease with which goal was (or was not) attained (a), and raise or lower level of aspiration accordingly on future decisions of this type. As can be seen, this decision process is quite different from the econologic model. In it we do not seek the best solution; instead, we look for a solution that is acceptable. The search behaviour is sequential in nature(evaluating one or two solutions at a time). 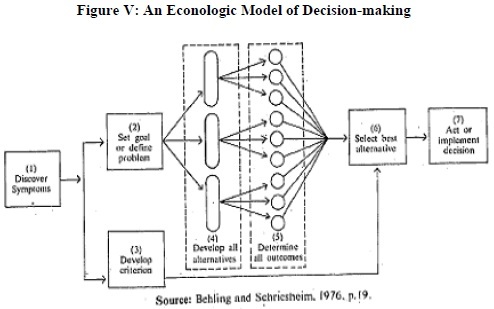 Finally, in contrast to the prescriptive econologic model, it is claimed that the bounded rationality model is descriptive; that is it describes how decision makers actually arrive at the identification of solutions to organisational problems. 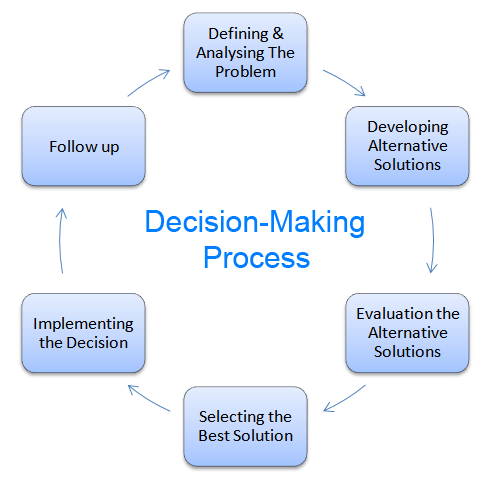 This model deals primarily with non-programmed decisions. You will recall that non-programmed decisions are decisions that are novel or unstructured, like seeking one's first job. Programmed decisions, in contrast, are more routine or repetitious in nature, like the procedures for admitting students to a secondary school. 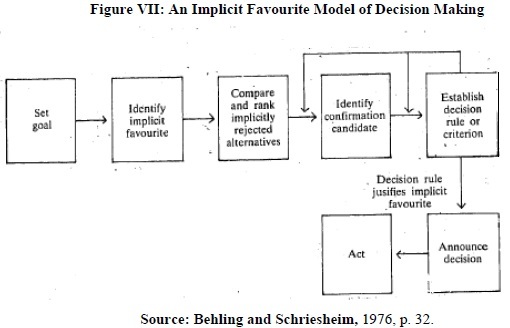 The implicit favourite model developed by Soelberg (1967) emerged when he observed the job choice process of graduating business students and noted that, in many cases, the students identified implicit favourites very early in the recruiting and choice process. However, they continued their search for additional alternatives and quickly selected the best alternative candidate, known as the confirmation candidate. 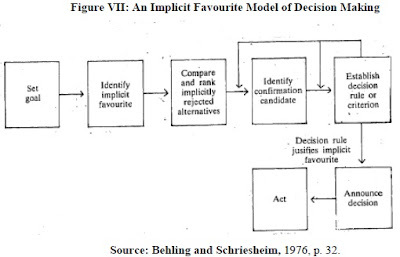 Next, the students attempted to develop decision rules the demonstrated unequivocally that the implicit favourite was superior to the alternative confirmation candidate. This was done through perceptual distortion of information about the two alternatives and through weighing systems designed to highlight the positive features of the implicit favourite. Finally, after a decision rule was derived that clearly favoured the implicit favourite, the decision was announced. Ironically, Soelberg noted that the implicit favourite was typically superior to the confirmation candidate on only or two dimensions. Even so, the decision makers generally characterized their decision rules as being multi-dimensional in nature. The process is shown in Figure VII. As noted, the entire process is designed to justify to the individual, through the guise of scientific rigour, a non-programmed decision that has already been made in intuitive fashion. By doing so, the individual becomes convinced that he or she is acting in a rational fashion and making a logical, reasoned decision on an important topic.